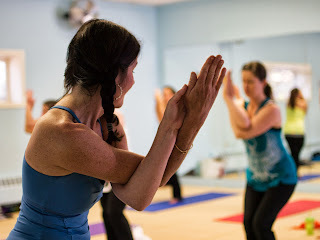 Astrology Yoga classes at Satya Sanctuary, Saturdays at Noon in June (except the 15th) $10 Drop in at 578 Congress St Portland, Maine above Strange Maine by Otto's Pizza. Astrology Yoga Workshops including Gallery Style Readings after Zodiac based Yoga. Mercury meets Jupiter in Gemini and the Moon and Pluto convene in Capricorn. Two very different influences dominate the day and you may feel one more than the other. The Gemini conjunction is all about opening to possibilities, taking an opportunity that's already there and deciding how to act on it, aiming for big things, prosperous creative partnerships, and moving beyond anything limiting. Mercury & Jupiter make it an excellent day for an important discussion and finding supporting players or resources to make dreams happen! Pluto and the Moon can trigger fears or entrench us in our secrets. Allowing the Gemini planets to unlock those places and work productively to let them go is ideal and can help us be more open and bright. Let a pointless "dark" feeling or something you've been holding out of the box today. Lighten the load your psyche has been bearing and see how you can move ahead and build and grow something worthy of your effort and attention. This is a significant day post eclipse if you've got plans in the works including business, travel, study and partnerships of all sorts. The ideal plan can come together today with Gemini's intellect and energy and Capricorn's practical nature. Today's color is yellow. Mars will leave Taurus on Friday, and these last few days can be very constructive. Capricorn Moon and Mars provide the instructions and the "how to" aspect as you work toward a goal, aim to finish a project, or build something to completion. If you're tying up loose ends as a result of eclipse changes, wrapping up one phase of life to move into another, the earth sign harmony today can really help work through it, taking it step by step and organizing and finalizing what needs to be done. Today is suited to builders and real estate business, matters involving security and strength, creating a fortress or solid business plan. Take safe, measured, practical action today preferable before the void of course Moon 2:40 to 5:48 pm EST (though working through those hours can be super productive as long as you already have the plan in place!). Tonight Venus and Jupiter have a gorgeous, blessed meeting in Gemini that's nothing short of ideal! Gemini this is such a gift to you and to Sagittarius, Aquarius and Leo for love and dearest hopes and wishes. Taurus and Scorpio can benefit with prosperity and business and Virgo gets the recognition she or he has earned! It's a great night for dates, plans with friends, creative inspiration and important heartfelt decisions. The Aquarius Moon adds a sense of community and ability to see the future while grounded in the now. Today's color is pink. The Aquarius Moon is ready to do good work and create ease with planets in Gemini this week. Though a square to Saturn may show up as stubborn unyielding nature in some cases, the Moon in harmony with the Sun and Uranus is original, progressive and full of energy. Create something unique or follow a new train of thought. It's a day to overthrow the norm for something more exciting. Aquarius Moon is the time to be the architect of your own life and draw up some plans. Lots of mental energy sometimes adds to anxiousness, but grounding in real work will keep the lid on that today. Leo and perhaps Scorpio have home and partnership things that are serious and about long term commitment. Aquarius and Taurus are also likely to relate to that on some level. Gemini and Aries, enjoy the harmony and energy of this planetary action today and tomorrow. Wear blue. Things may fall together easily today, even after change or struggle. The Moon's trine to 3 planets in Gemini may help communication most of all and that includes professional and personal interactions, business marketing and contacts, interviews, and negotiating or deciding important things together as couples. On this very fortunate, visionary and agreeable day, time conversations, requests, and pursue goals. Aquarius and Gemini, feel the positivity and get yes answers! Libra, feel fate and opportunity at work for you! Taurus, Mars in your sign for one more day and night is square to the Moon and you could feel uncertain or stubborn about change, but there are some great career and prosperity vibes in the air for you so stay open minded. Tonight is good for work or socializing. The Moon moves to Pisces at 8:30 pm for a winding down effect. Any relaxation or free time will be welcome tonight. Today's color is turquoise. The activity is in mutable signs today as the Moon and Neptune have their monthly meeting in Pisces, emphasizing spirituality, mini vacations, and whatever puts you in a meditative, connected mood. Movies and music appeal to our need for break and escape. Creativity flows and takes precedence over logical thought and other business. We're more personally than professionally inclined today. Mars moves to Gemini, changing our mental focus from the physical realm of Taurus to the idea oriented sign of writers, thinkers, and media and marketing professional in the weeks ahead. If you're a Gemini, Aquarius, Cancer or Capricorn you may want to delegate the physical work while you do your best thinking and this will apply to other signs with strong air sign influences too. Mercury in Cancer encourages decisions about cohabitation, family matters, and emotional situations in the weeks ahead and will retrograde here in late June. Today's color is light green. The Moon squares Gemini planets and we attempt to understand information, decide what ideas to act on, and reconcile emotions and intellect if we are at our best. The Sun in Gemini and the Uranus/Pluto square in Aries and Capricorn combine to run plenty of electric energy and that can make us edgy, nervous or uncertain. The Sun aligns with Uranus adding to the current and stimulating minds and potentially motivation especially for Aries, Sagittarius, Leo and the air signs. Pisces Moon activities like mediation, yoga, and even gardening or walking near the water can help soothe the nervous system if it's on overload. Being with most trusted friends is favored over big groups though the thought of getting lost for a while might be appealing. Wear orange today. Mercury and Venus in Cancer makes these weeks nice for lovers and sentimental journeys. The pull to our nearest and dearest is strong in the weeks ahead. Venus in Cancer brings Cancer back to the realm of true love and relationship, settling down, creating a happy home and good meals, and connecting more strongly in all personal relationships. There's a back to earth and water feeling that sends us to the garden, the lake, and places to relax or recreate outdoors. Mercury instigates heartfelt conversations, and in business there's a conservative, local, close to home effect. Taking it back home now or soon is in the forecast today. Nourishment is the theme of the day. The Moon is in Aries as of 2:33 am, and cleaning house, eliminating what you don't need anymore and being generally active is likely to feel good. Wear white. Because Uranus in Aries squares Pluto in Capricorn, today is a wild card. This can be disruptive and bring up things we'd rather not deal with as well as contribute to the energy around incidents that cannot be foreseen. Play it a bit close to home today, and don't open yourself to risks, privacy issues, or anything that could be unsavory. The Moon begins in Virgo and the morning hours are for practical problem solving and looking at facts or figures. The Libra Moon moves in at 1:07, barely skipping a void of course beat for about 20 minutes before that. Libra Moon is good for working both sides of an issue fairly and seeing opposite points of view to help with good decision making. Mercury engages with Uranus later, making the most unpredictable and rebellious influences in the zodiac the biggest planetary player of the day. You may be surprised at what you hear tonight. Outrageous words could be spoken and it's better not to react or take those kinds of things as truth right away. The Sun moves to Gemini at 5:09 pm. Today's color is blue. The Moon works with Venus and Mercury in Gemini which is excellent for sorting out ideas and options and aiming for logical decisions. Find balance in your way of thinking. See the merit in someone's plan or idea. Pluto and Uranus both engage the Moon continuing some of yesterday's uneasiness or disruption and that can include a power struggle, yet the Libra Moon is the zodiac's mediator. Find compromise even in chaos today, even if the plan is temporary. Wear lavender. The Libra Moon works with Jupiter in Gemini on a day that presents benefits and possibilities. Explore ideas through books, conversations, web searches, and advice from professionals. It's a great day to connect with a lead, make a new friend who becomes important to you, find a mentor, or accept an offer. The Moon is void from 3:35 am when the two align until 4:55 pm. Even with a void of course Moon, move forward, document agreements well, and don't waste any time over-thinking if you feel the timing is right. The Scorpio Moon tonight is useful for tuning in to instincts and focusing on matters at hand. Try not to obsess over details while paying close attention to them. It's a fine line. Wear maroon. The Moon's monthly check in from Saturn means a serious outlook today. Answering to authority, dealing with pressures that recur, and making long term decisions are all likelihoods. Pluto points out the history and soul of the matter with a slightly practical, earthly outlook from Capricorn. Don't dismiss patterns that contain important information about someone's repetitive behavior or your own, habits that are tough to change, or secrets from the past that are still relevant now. Do your best to show responsibility, loyalty, and integrity and you'll mesh best with Saturn's influence. Tonight is more for work or solitary pastimes than social events. If you're going out be with someone trusted and close. We are in the zone of a Full Moon and eclipse on Saturday (overnight tomorrow). If you're incline to get that feeling of something coming, you're tuned in during tonight's Scorpio Moon. Wear black. This is a very good day for finding agreement, making promises, agreeing to a contract or improving communication in a relationship. Mercury meets Venus in Gemini and for Taurus and Scorpio this is financially beneficial. Pisces can relates this in home life, and Virgo can make a big career splash or other strong positive impression. Leo finds this hopeful or seals the deal on an important wish, dream or relationship matter. Sagittarius, this is an ideal day to renegotiate something with your significant other or decide to make a relationship more long term. Have an important talk with someone today, everyone! See if you can finally agree, communicate more clearly, find romance or love and generally make improvements. The Moon is in Scorpio day time and moves to Sagittarius at 5:49 pm EST. The Sagittarius lunar eclipse overnight tonight brings a 2 year cycle to a conclusion. Think back to June and late May of 2011 and find resolution or reconnect productively from something initiated then. Get out of a stubborn way of thinking! Challenge yourself. Be adventurous and open minded. Wear yellow. The lunar eclipse in Sagittarius brings two years of eclipse activity full circle. The Full Moon is exact at 12:25 am EST. Neptune is square to the Moon with a spiritual influence and a challenge to look beyond the ordinary and find greater meaning. This is also a call to creativity and adventure. The eclipse will open hearts and minds as activity centers in Sagittarius, Gemini and Pisces, the mutable signs. We can change willingly or warp up this phase kicking and screaming like a newborn but either way things will not be the same as a result of announcements, surprises, new endeavors, and resolutions or awakenings we experience now through the Full Moon of June 23rd. Sagittarius is an explorer and uncharted territory is a theme of this lunar eclipse. As a lunar eclipse always relates to Cancer, the Moon's home sign, Cancer finds the reason to break routine and habits and rework the results and patterns established since June of 2011. Scorpio and Taurus, good reasons to make some financial decisions come with this eclipse. Spending or investing your money differently or moving into new work has strong probability especially if you're Scorpio or Pisces in search of. Today's color is white. The Sagittarius Moon faces 3 planets in Gemini, still in the throes of yesterday's eclipse. These are the two signs of polarity in the eclipse cycle that's just ending from spring 2011 to the present. The oppositions indicate how much there is to work out, find agreement on, productively discuss and decide. The eclipse events are usually nothing we have control over and may be unexpected or much faster than anticipated. Our responses and decisions we have more influence on though! Brainstorm and share ideas with someone who cares about you and can influence or assist in your process and changes that are now or imminent. Venus is love and harmony, Jupiter is blessings and expansion, and Mercury is communication and the process. All three face the Moon for resolution and direction. Sagittarius eclipse opens our minds and expands our world beyond what we're accustomed to. Reach an agreement today and then move on it with a sense of adventure. The Sun in Gemini and Neptune in Pisces complete activity in the mutable signs, further strengthening the idea of change, movement, and a creative, open minded approach to big transitions. The Capricorn Moon arrives at 5:28 pm, grounding us in tasks and to do lists, building and making things. Today's color is green. Join my email list for workshops, readings and events! Yog-Astrology Workshop with readings and yoga practice for all signs with an astrology perspective! Learn postures related to your zodiac sign, the body rulerships of each sign, and take home a practice you can always go back to on your own! Readings for each sign and questions in a gallery style setting at Hart Yoga in Brunswick, Maine. Email to register (click to email). 11 am to 1:30 Saturday, May 18th. The Moon moves to Cancer at 6:07 am EST. Cancer Moon is a time when we need attention and reassurance. Saturn's influence is once again balanced by Neptune's action with the Moon. Saturn in Scorpio is emotionally rough, however Neptune provides the romance, love and creative expression that may take the edge off. Venus is square to Neptune encouraging progress in relationships. While you're falling in love or renewing your commitment, do stay realistic and willing to confront differences. Creative problem solving in relationships is in the forecast too! When the Moon is in Cancer we sometimes stuff our feelings or avoid an issue. It's best not to do that today. Venus is at work for harmony and Saturn urges us to deal with things up front and honestly. Today's color is blue. The Cancer Moon squares Uranus and opposes Pluto. This does not set up an easy day. Emotions may flare and the darker or more challenging aspects of situations could up for some resolution. This is a familiar pattern that might feel like a Full Moon. Sort out feelings before reacting too quickly while trying not to avoid the matters at hand. They will resurface over and over, so there' s no time like the present. Tonight the Moon and Mars work together. If today was draining, Mars may help boost energy or motivation, from Taurus. We'll tend to protect and defend the people and things that matter most to us today. Place your loyalty and action where it's deserved. Today's color is black. Mercury moves to Gemini, home sign for the planet of communication. We think about changes in transportation, phone plans, and methods of communicating now. If you've got the urge for a new car or bike, Mercury in Gemini is likely to make that stronger! It's also a very busy time for planning, making decisions, writing and getting things in writing. The retrograde will be late June and early July and this is a better time to get these kinds of things settled or in the works. The Moon is in Cancer until 6:38 pm, and void of course from 8:14 am until then. These could be confusing hours for decision making, before 6:38 pm. Leave the right to change your mind. Something you thought you had settled on may look different today because of new information or just a change in perspective. The Moon is in agreement with the Sun and Mercury, and tonight things may seem more clear and it's a good night to have an important talk. Leo, Gemini, & Aries may really need to discuss to sort something out. Tonight is outgoing and expressive whether you're working or socializing and it's a big night for phone conversations too. Wear yellow. The Moon is in harmony with Venus in Gemini for a continuation of last night's social vibes. Getting along, meeting new friends, connecting with each other, and being responsive and open minded is in the forecast. Saturn does weigh in from Scorpio, a sign that may find career move or decision important today, and Libra may need to make a big financial or job decision, while Sagittarius and Aquarius have some interesting relationship matters on their minds. For Leo, significant decisions and events around home and family life are present today and all spring long with the eclipses prompting major activity there. Gemini and Aquarius, Venus should be making your love life interesting and creating some luck and ability to attract what you want or need. Today's color is purple. The Leo Moon and Jupiter in Gemini are highly optimistic, communicative, and set for action. These two set us up for opportunity, good ideas, open minded thinking, and help out writers and other creative people who need to make things happen. Mars is also in the picture, squaring the Moon from Taurus. This may help with practical ways of doing things and it also may feel like something that gets in the way at first but it's all in the name of progress, not rushing and doing things right. Listen to advice and at least consider another point of view today. It might even be something like how to best take care of your kids or something related to vacation or education. Leo Moon is the sign of performers and politicians too, and people in the spotlight may include Leo and Scorpio as well as Gemini where Venus is right now. Capricorn, it could be a good day to make a financial decision or find out something is going in your favor. Wear gold today. There are a variety of planets at work today influencing the Virgo Moon. The second quarter Moon arrived in Leo shortly after midnight eastern time, and we need to feel and see progress now. Changes from last week's eclipse continue to develop and vibrate. We're in the midst of great change, and Virgo is a mutable sign of the zodiac. Today is likely to show all the things that are in flux. Finding some way to organize and to harness scattered energy is a good plan for the day. Do something physical like yoga or a workout or something that orders your environment like put up shelves and figure out where to store things. The Moon squares Mercury and there's nervous reactions especially to important conversations or in anticipation of them. Venus and Uranus aim for relationship surprises and changes including for Sagittarius, Gemini, and Libra. Today, aim for some sense of order and calm. Wear navy blue. A mixed Virgo Moon day with squares that represent hurdles & work for progress and two easier trines with Mars and Pluto in the other earth signs. Using the hands, the body, and physical sensibilities strengthen our position today. Take an involved and constructive approach. Analyze information and put it to good use. The squares with Venus and Jupiter represent overcoming mental energy that could be rooted in anxiety or miscommunication. Make sure you're acting on the right information and not making assumptions particularly in personal relationships and with potentially good opportunities. Today's color is brown.